Mar. 8, 2019: Due to recent storms the MASH Site is inaccessible from the Malibu Creek State Park trailhead. Dec. 18, 2018: Malibu Creek State Park has reopened the day-use areas and the backcountry of the park. The campground remains closed until further. State Parks lost some structures due to the Woolsey Fire, such as employee residences, the historic Sepulveda Adobe, Red House, Hope Ranch also known as the White Oak Barn (including historic Adamson rowboats) and Reagan Ranch. For the latest information on how the wildfires have impacted our state parks, visit our newsroom at www.parks.ca.gov/newsroom. Wildlife: Please help us protect our wildlife in fire-impacted areas. Leaving food and water out for them post-fire can do more harm than good. Our wildlife can suffer complications or illness by feeding supplemental food or an unnatural diet. Thanks for keeping our wildlife wild. The gates are open from 8am-10pm. 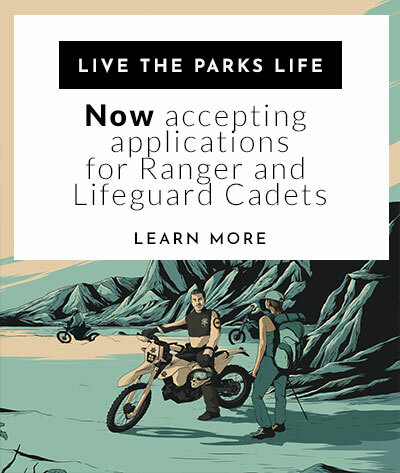 The park is located four miles south of Highway 101 on Las Virgenes/Malibu Canyon Road. Campgrounds at Malibu Creek State Park are closed until further notice due to an ongoing investigation by the Los Angeles County Sheriff’s Department. To ensure public safety, all camping reservations for the park have been cancelled until the campground reopens. Reservation holders are being contacted and refunds will be provided. Day-use areas at the park will remain open. California State Parks apologizes for the inconvenience. However, the safety of our park visitors is our top priority. California State Parks issued a statement on the incident on Monday, June 25. 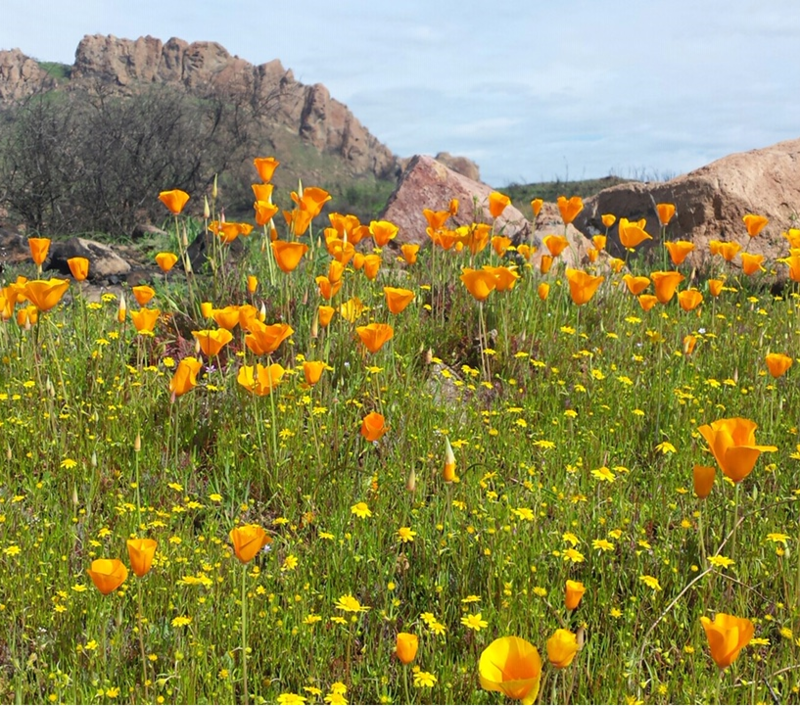 Wildflower Bloom: Updated March 5, 2019 - Wildflowers are currently blooming at the park along the Crags Road trail and the hillsides above the M*A*S*H site. You can see California Poppies and purple lupin primarily. Malibu Creek State Park, just 25 miles from downtown Los Angeles, features hiking, fishing, bird watching, mountain biking, rock climbing and horseback riding opportunities. Fourteen-mile Malibu Creek is the principal watercourse of the Santa Monica Mountains that ends at Malibu Lagoon. . There are 15 miles of streamside trail through oak and sycamore woodlands on chaparral-covered slopes. Following the trail along Malibu Creek, the visitor will be treated to spectacular vistas, including volcanic rock gorges, scenic pools, and breathtaking views of the Las Virgenes Valley and Malibu Canyon. Culturally, this area was the center of Chumash Native American life for centuries. One of the park's most significant points of interest is the Sepulveda Adobe, which was constructed in 1863 on what had been part of an early Spanish land grant. This historic structure was restored in 2003 and is now open to the public. In the early 1900's another adobe was built along Malibu Creek by Johnny Mott, a famous LA attorney. With only the dramatic stone fireplace left standing, it is known today as the Mott Adobe ruins. Perhaps the most prominent frequent guest at the Mott Adobe was President Herbert Hoover. Previous to being opened to the public in 1976, the park was used extensively to film numerous movies and TV shows, such as Planet of the Apes and M*A*S*H. Most of the park's land holdings were donated by Bob Hope, with later significant acquisitions from Ronald Reagan and 20th Century Fox. From the 101exit on Las Virgenes Road. Park entrance will be on the right, a little past the Mullholland Drive intersection. Showers: The park's showers are token-operated. The token machines accept ONLY one dollar bills. Change for larger bills is not available at this time. Firewood policy: Firewood is allowed to be burned in a fire rings in the campground on LOW (Green) level Fire Safety Day(s). Burning firelogs (ex: Duraflame log) and charcoal briquettes in the fire rings is allowed when fire level is at Medium (Yellow) and weather permits. 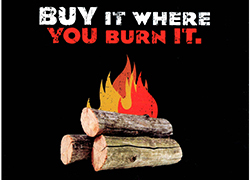 On a HIGH (Red) level wood, firelogs, or briquettes are NOT allowed to be burned. Check the sign near the campground entrance to see the day's fire level. 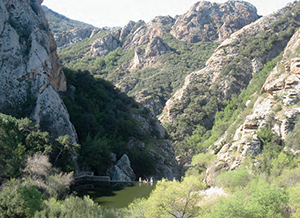 Malibu Creek State Park contains excellent exposures of the Conejo Volcanics that cover large portions of the modern Santa Monica Mountains of the Transverse Ranges geomorphic province. The Conjeo Volcanics are one of several Miocene volcanic fields along the California coast that erupted in response to a major reorientation of the tectonic plate boundary between the North American tectonic plate, the subducting Monterey microplate, and the better-known Farallon Plate. The reorientation caused local areas of extension and crustal thinning. The molten rocks below the thin oceanic crust ascended through the crust along fractures to the surface and erupted as volcanic rocks. Dogs on a leash are allowed in the park's day use areas and campground. Dogs are not allowed on the backcountry trails or dirt roads.